The Geforce MX Chipset found on the Hercules Prophet MX Dual Display, is targeted at a few different market sectors, the home user and the business user, it is a dual purpose dual display card. The beauty of the MX chipset found is that it allows simultaneous output, on both TV and monitor. Allowing a picture to be displayed on the monitor and on a large screen TV, this could be useful for presentations to groups of people, or simply for watching DVD's and Video CD's at Home. Outstanding resolutions of up to 2048x1536 in 16 million colors performed with a 350MHz RAMDAC on the first monitor. 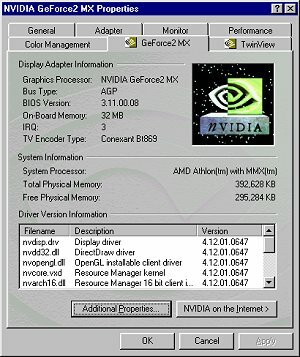 Running Win98 SE and Via 4in 1 driver 4.25a with Nvidia detonator 6.47, to overclock the card I used the standard Nvidia reg file "CoolBits.reg" available here Computer was running at AGP 4* with fast writes turned on and memory set at Turbo and 4 way interleave. The Abit KT7 board that I run is very flexible and it allows me to run my CPU at anywhere between 700Mhz and 1300Mhz, so the benchmarks are conducted at these two CPU speeds. Default clock speed on the Hercules MX is 175Mhz core, 183Mhz Memory speed, the memory is 5.5ns Hyundai SDRAM on this board, faster ram than on the Elsa MX that I tested previously. The Hercules MX still uses a cool looking blue heatsink, but this time due to the lower core speed and the fact that the memory access on the MX is only 128bit it probably doesn't get warm enough at default settings to require a fan. I managed to overclock the Hercules MX to 205Mhz core and 215Mhz memory speed, I did have some stability problems so I ran the test at 205Mhz Core and 210Mhz memory and it ran fine. I ran the CPU at 1300Mhz first, the graph below shows the FPS scored for the Graphics card, the "c" denotes overclocked Graphics Card score. 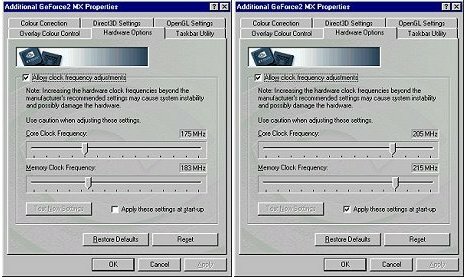 I did have some stability problem with this card in Quake 3, It kept on crashing on me I set it down to AGP*2 and it worked fine, I am somewhat puzzled as to what caused it, I tried running at default graphics card speed and the problems still occurred. All the other Hercules Cards ran fine at AGP*4. 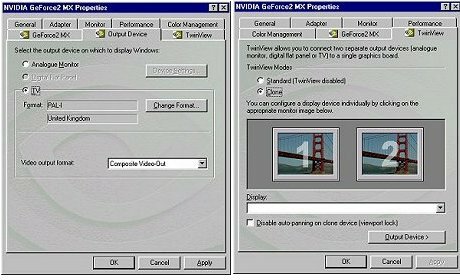 Since AGP hardly affects most current games I don't think I lost many FPS because of resorting to AGP *2 and, maybe a clean install of Windows 98, would have sorted the problem out. It ran fine in D3D in AGP*4 mode. Now onwards with the D3D benchmarks. available here, this benchmark is slightly less CPU limited and provides a bit of a change from running endless loops of UTbench.dem. The Graph shows results at all the resolutions, with two different CPU speeds. The small after the CPU speed indicates the overclocked graphics card benchmarks score "c"
The results speak for themselves, as the resolution goes up the 3DMark score goes down simple as that, but, at a certain point they level out, The faster CPU gives quite a lead up until 1024*768 resolution then, both scores begin to even out as the Graphics card becomes a bottleneck only around 400 marks seperates the scores in the higher resolutions. Although you can't actually play 3dmark it still gives a good indication of system and graphics card performance, look out for a round up of the Hercules Geforce cards soon, to see just how they all compare. As I said previously the MX supports simultaneous output to a monitor and a TV, some of them support Dual monitor configuration as well small text display on the TV screen is rather flickery, and blurred but larger text is pretty acceptable on my 25" Nicam TV. A better TV would no doubt, produce slightly better results. Once TV output is enabled the picture is only sent to the TV screen, to enable dual support you have to select Clone as show above, then the picture is displayed simultaneously on both Monitor and TV, more pictures below show Twinview in action, I ran 3DMark 2000 with twinview enabled, I did run at 800*600 resolution and came out with nearly the same score as before, losing just 300 3DMarks, this maybe be due to the card working harder to output two displays I suppose. 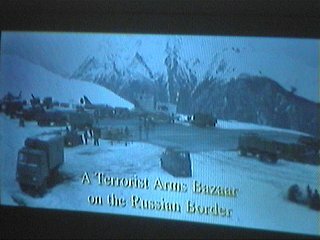 The image on the right is the TV image. And here a slightly better picture of TVoutput, showing the Bond Film "Tommorow never dies"
The Geforce 2 MX also has one last trick up it's sleeve "Digital Vibrance Control" (DVC) this feature basically seems to brighten up the display output, it seem t over saturate the colours on my 19" monitor, I cant really see much use for this feature, unless you have an old worn out monitor that needs brightening up, anyway below are pictures showing DVC in action. I had to fiddle with the image in a paint programme because a normal print screen command doesn't show the extra brightness. 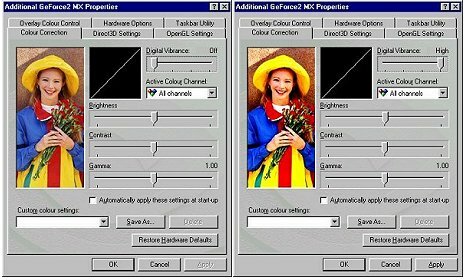 The image on the right has Digital Vibrance turned on fully, the control panel doesn't seem to change colour more just icons on the desktop and noticeably the woman in the picture above. Well with all the features looked at it's time to draw some sort of conclusion. All in all the card performs very well for what is still considered a budget card, although around £110 may not seem budget, to some people, it has all the features of the more expensive Geforce 2 GTS, with a few added extras, but without quite as much speed, and at half the cost, so it's certainly worth looking at for a lot of people out there, who do not want the fastest gaming experience, simply can't afford it, or who simply do not have a big monitor. It is only in the higher resolutions that the bottleneck on the MX becomes apparent, so if you are still using a a 14" or 15" monitor then the MX will probably do all you ask of it and more (O:.